Ref: WV1001 – Abanilla (Murcia). 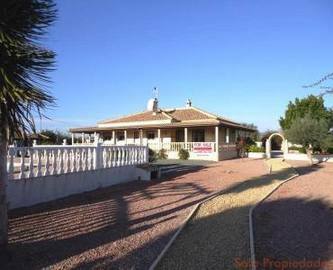 – This fabulous Detached Villa of approx. 220m2 build is set on a plot of approx. 2-200m2. With easy maintenance gardens and shaded areas for those hot summers you will also find a large 10×5 swimming pool with Roman steps. 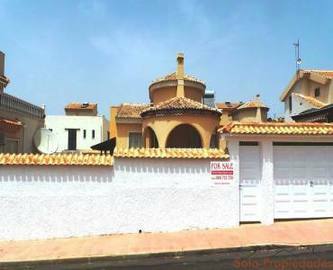 There is plenty of parking area to the front of the property and the villa has an internal garage on the far end. The villa has a very large covered sun terrace at the front and the main door leads into the entrance hall. There are French doors into the large lounge/diner which has a fitted wood burner in the fire place- Sat-TV and telephone and internet installed. There are ceiling fans fitted and there is an access door to the garden. Back off of the hallway there is an independent fully fitted kitchen with a separate utility room which is a good spacious size. Back of the hallway you will find the family bathroom with bath and shower over. There are also four double guest bedrooms and then there is the master bedroom which has an en-suite bathroom with a walk-in shower. This property is being sold part furnished- there is pre-installation for central heating and the property has mains water and mains electric with a habitation certificate in place. In the grounds there is a pool bathroom with a large outdoor BBQ kitchen. Definitely worth a viewing. Suma (council tax) is approx. 450 ?? per year.